Toy Chest Theater: Thanos and…Pooh? I don’t mean that in a bad way at all. I’m spotlighting this image, after all. But what the hell is this? 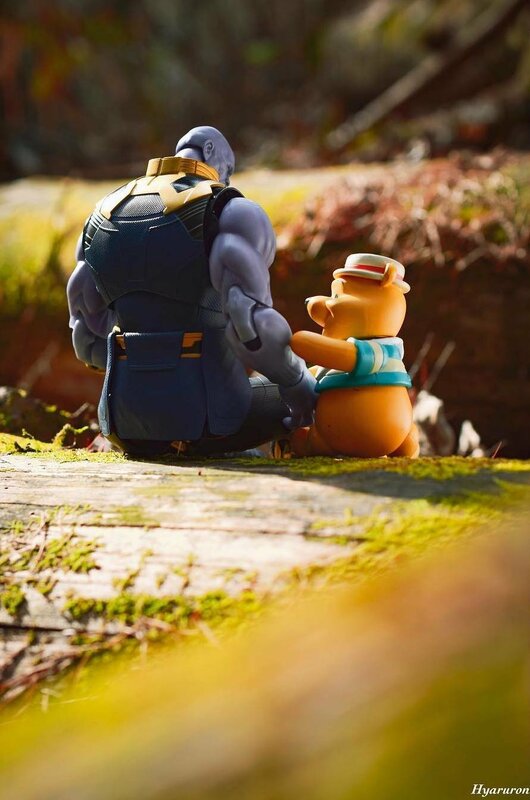 The really funny thing about this image by Hyaruron is that because both the Marvel and Winnie the Pooh brands are owned by Disney, this is one of those scenes that could conceivably happen someday. Like in a Who Framed Roger Rabbit? or Ralph Breaks the Internet type movie. Incidentally, can someone tell me why Pooh is wearing that outfit? I’ve poked around looking for that figure, and can’t find it. There’s nothing wrong with it, of course. It’s just that, like this image itself, it’s really random. This entry was posted in Toy Chest Theater and tagged action figure photography, action figures, Avengers: Endgame, Avengers: Infinity War, Hyaruron, Marvel, Marvel toys, Pooh, Rob Siebert, Thanos, Toy Chest Theater, toy photography, toys, Winnie the Pooh on 01/30/2019 by primaryignition.